A fabulous vintage white coral gold butterfly brooch by Van Cleef & Arpels. A smooth white coral butterfly, edged in textured 18kt yellow gold, has a round brilliant cut diamond in the center. 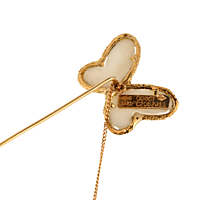 It is attached to a solid gold pin and delicate chain with the traditional push pin closure. Pendant Dimensions 2.67" by .86"